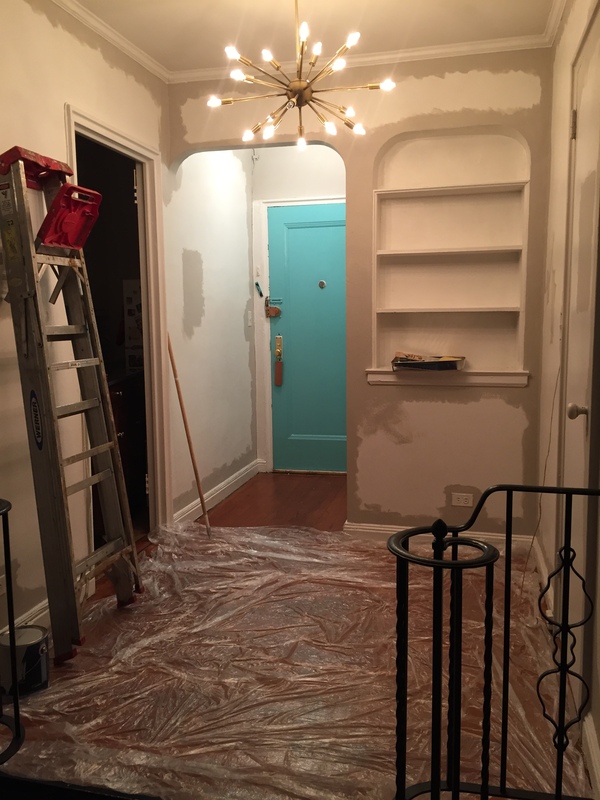 After a weekend and a night of painting the entryway, dining area, and dressing room, the last room to paint was the living room. 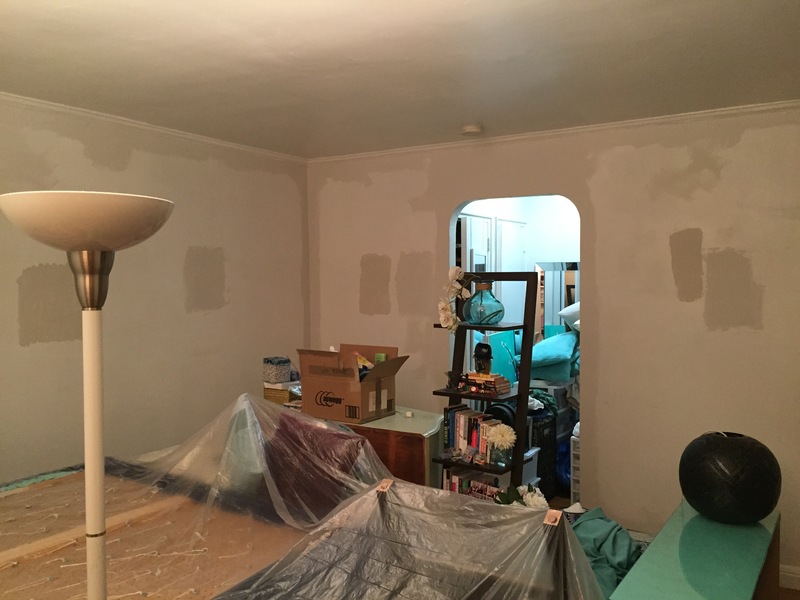 (The kitchen and bathroom will be painted after they’re remodeled.) I picked Benjamin Moore Silver Satin in the eggshell finish. 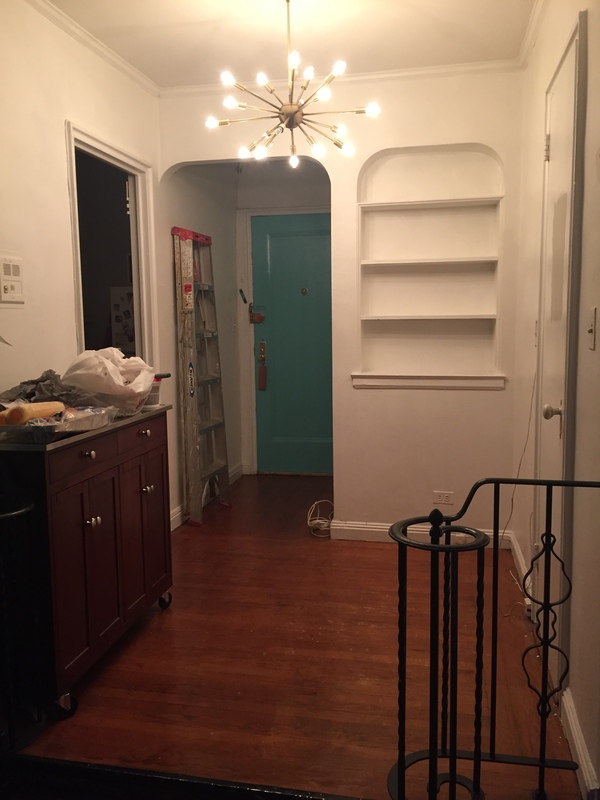 It became an interesting challenge, as there isn’t enough space in my apartment to move the furniture farther than a few feet away from the living room walls. 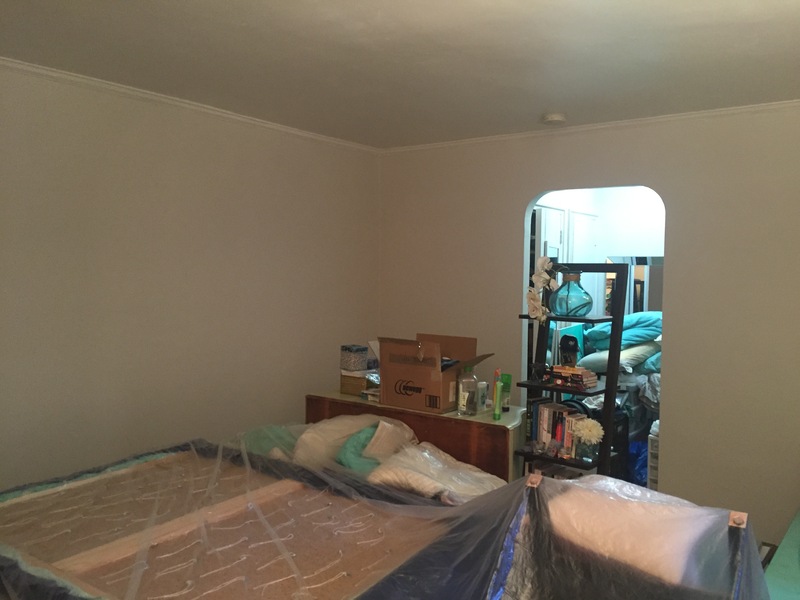 I draped a plastic drop cloth over the important pieces, and used another on the floor as I went around the room. I thought this room would be quick because there aren’t any doors, but cutting in took almost four hours! Rolling was faster, but still took over an hour. 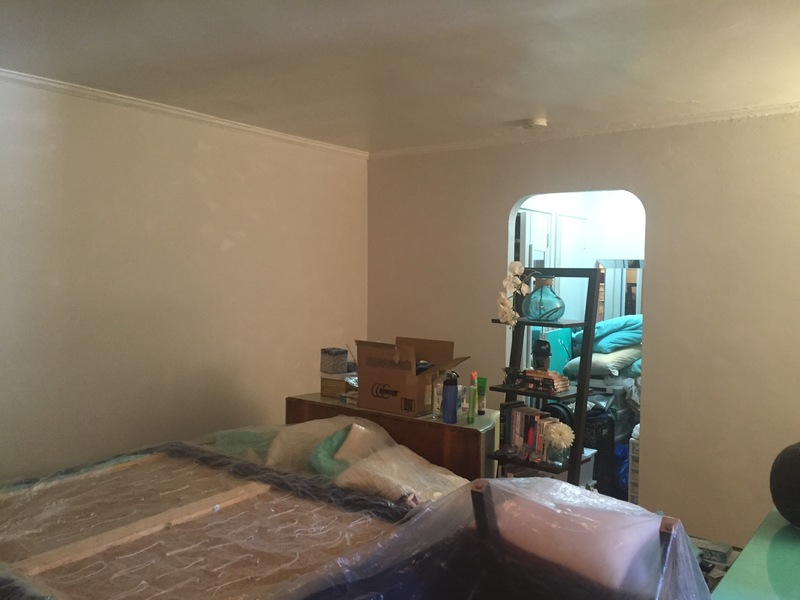 The second coat took just as long, and it was difficult to see where I had painted, since the color was so light, and the living room is dark (no overhead light, and a window that’s north-facing with a building 10 feet away). It’s a very subtle color! 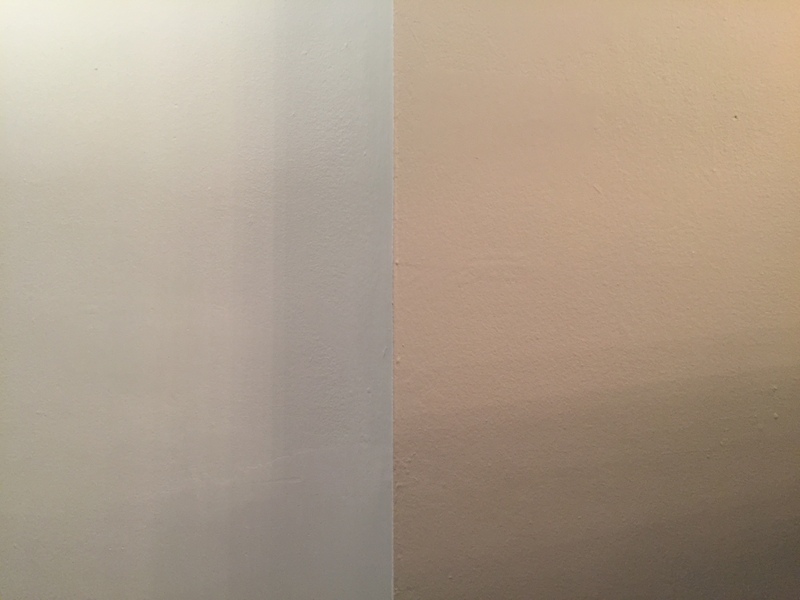 I think the biggest change was going to a flatter finish from the semi-gloss that was there before. One of my favorite things though is that depending on the light, it almost looks the same as the much darker color in the dining area! In the picture below, the living room is on the left and the dining area is on the right. Right now I’m just so excited that there’s no more painting to be done! Well, except for the base and crown mouldings, but those seem like small potatoes compared to all the walls I’ve painted in the last few weeks. 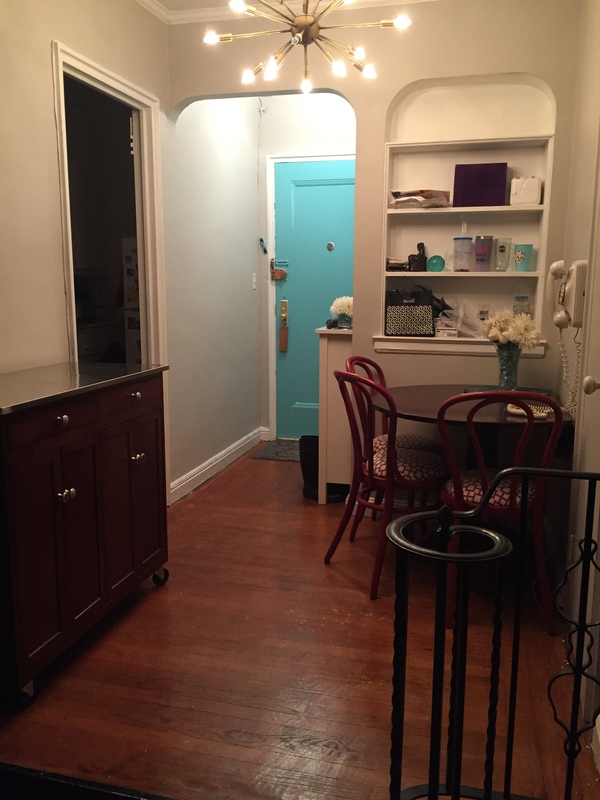 When I was painting the entryway and dining area, I also painted the dressing room the same color (Benjamin Moore Apparition). Somehow this tiny room took almost as much time as the larger area! 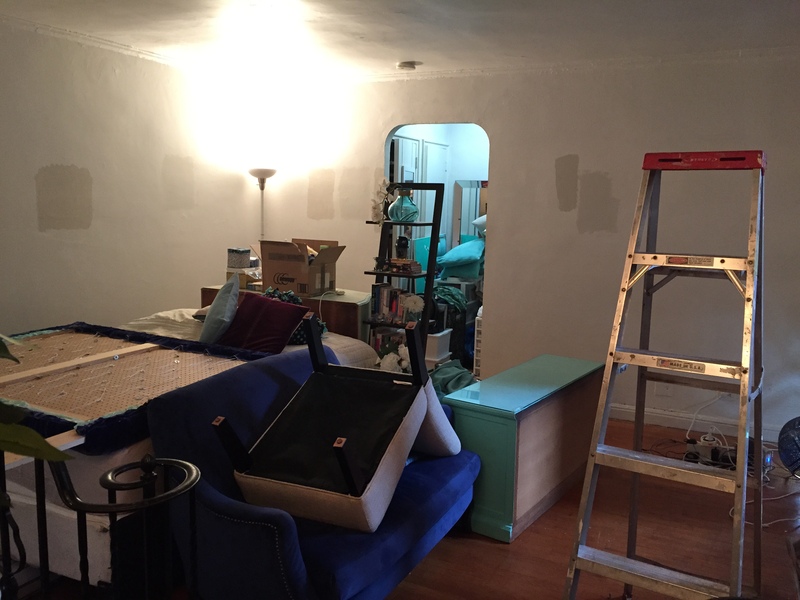 First up was to remove everything, which was just the mirror and chair. There was a lot of cutting in, since I was also painting all three doors and mouldings. 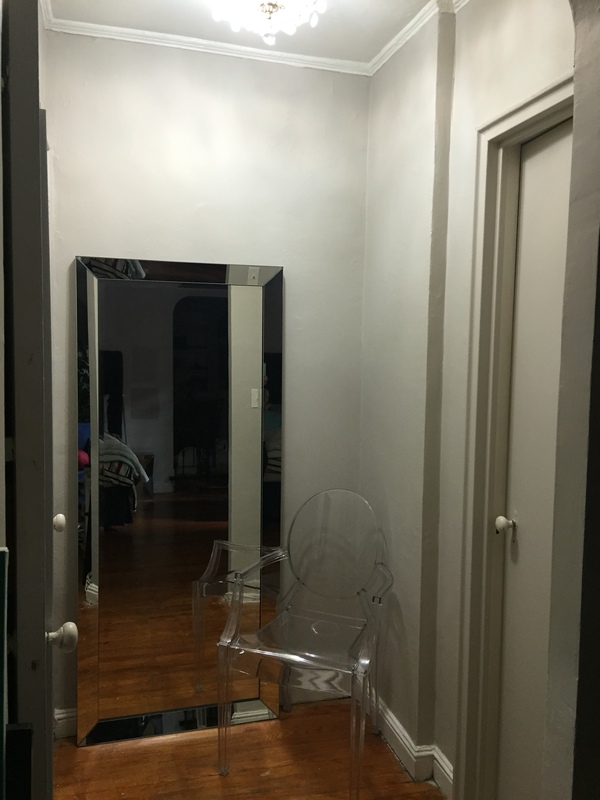 The second coat was more of the same (thought on a different night), and then it was time to put the mirror and chair back! I really like the color I chose! It’s darker (and less shiny) than the white that was there before, but I think it’s the perfect dark white color–if there is such a thing as “dark white”. Last week marked five months of living in my new place! It was never my intention of going without pictures on the wall for so long, but it made sense to wait until after the walls were painted before hanging things up. The first area to get art was over the dining table. 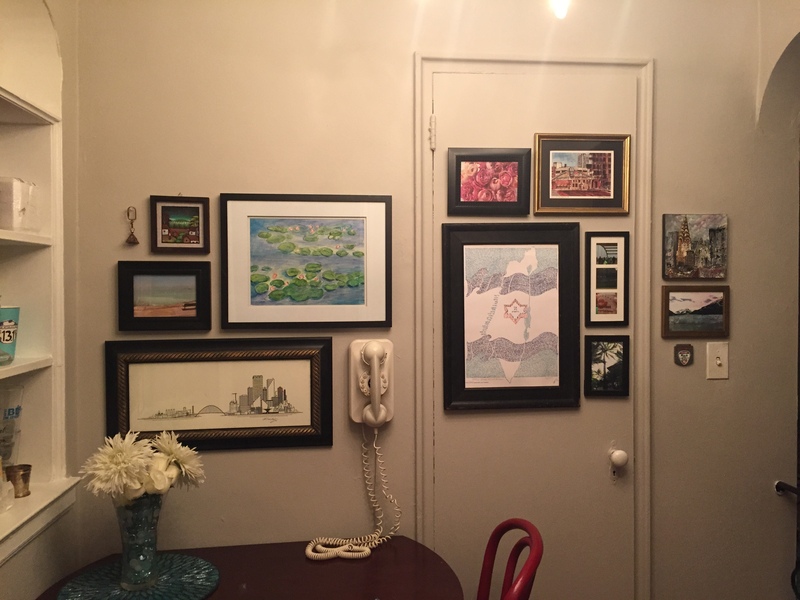 In my last apartment, I did a gallery wall over the dining table, and I was so excited to do it again–though in a slightly smaller version. 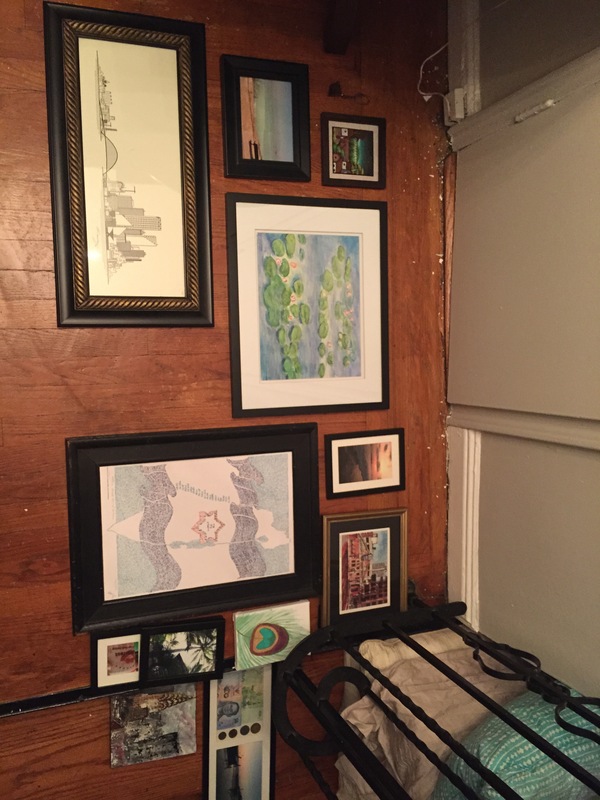 First up was laying the frames out on the floor, to get an idea of which frames and pictures look good next to each other. Then it was time to hang them with my favorite home product: 3M Command Strips. I might play around with some of the frames and placement, but I’m really happy to finally have some art on the walls! And bonus points for me because it makes the phone look like a quirky art piece! I neglected to show one angle in the dining area in my previous painting post. Gasp! 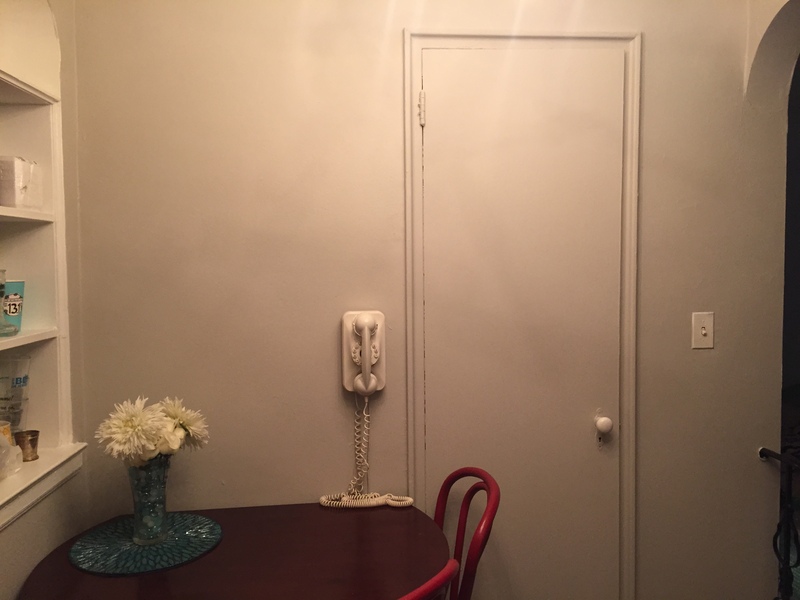 The door and frame are the same color as the wall! Yup! 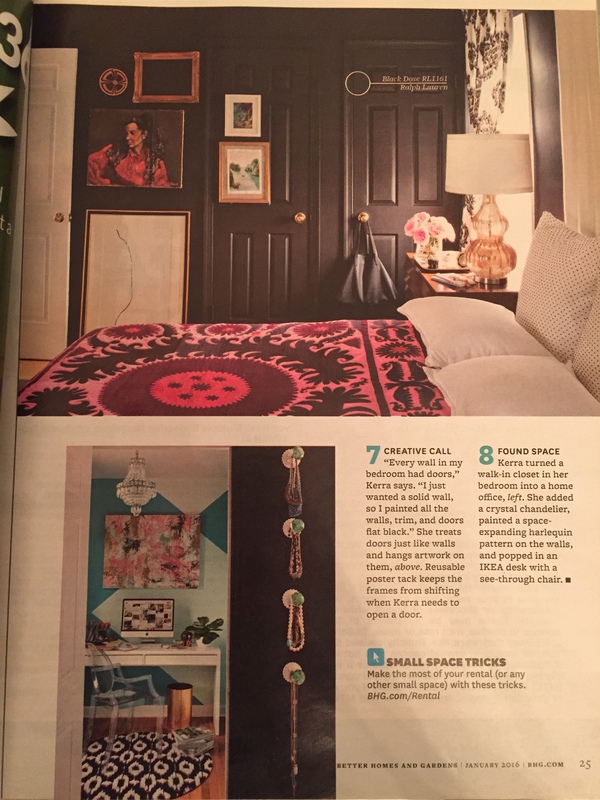 🙂 In an old issue of Better Homes and Garden, a designer had a lot of doors in her bedroom, which she painted the same color as the walls to minimize their appearance, and allow for more flexible art arrangement (point #7). 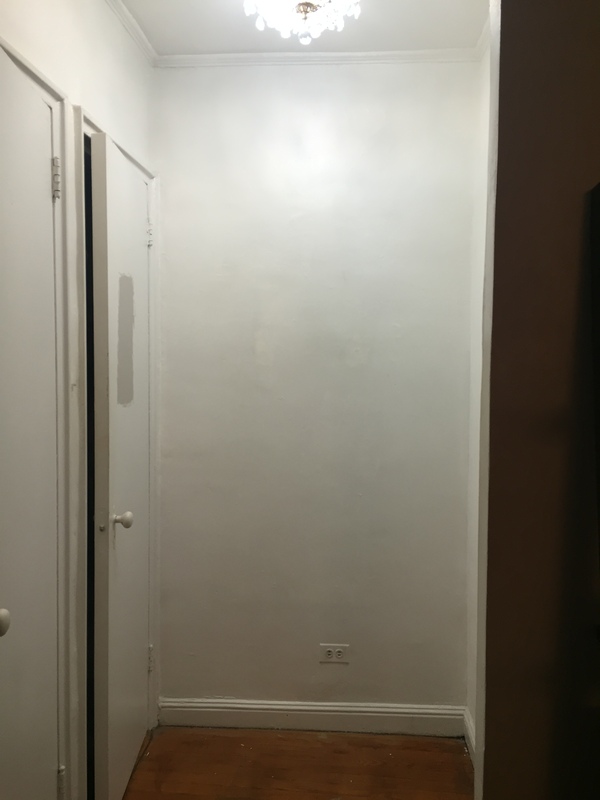 I remember thinking it was a great idea (probably even before my apartment was a twinkle in my eye), and given my apartment’s lack of wall space without doors or openings, I was excited to try it out for myself! 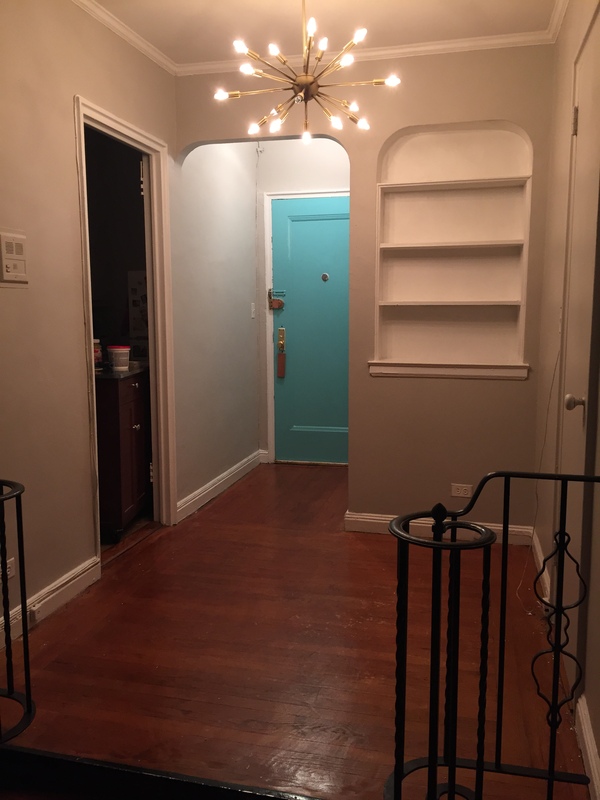 I’m loving the way the door and trim look painted the wall color. 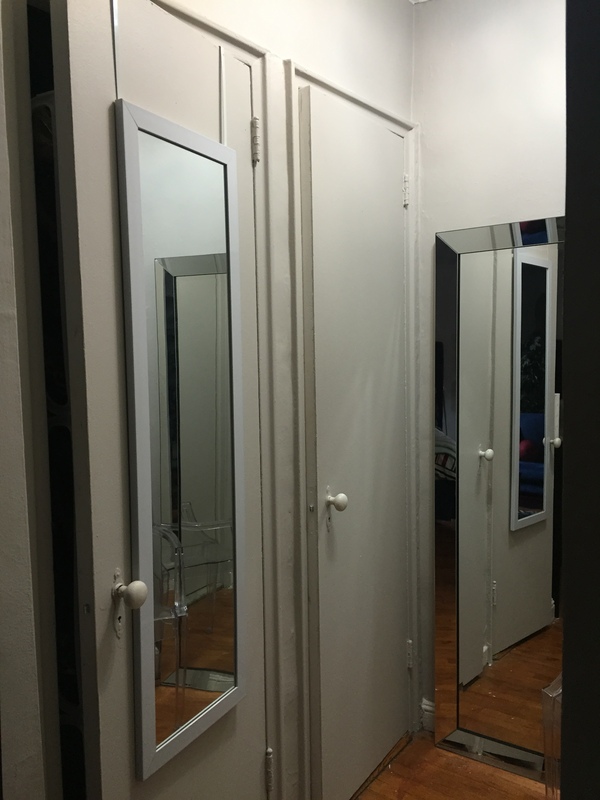 Can’t wait to use this same idea in my dressing room–which has three doors! Nope, nothing is on fire here, but I did stop, drop, and roll this weekend–with paint! 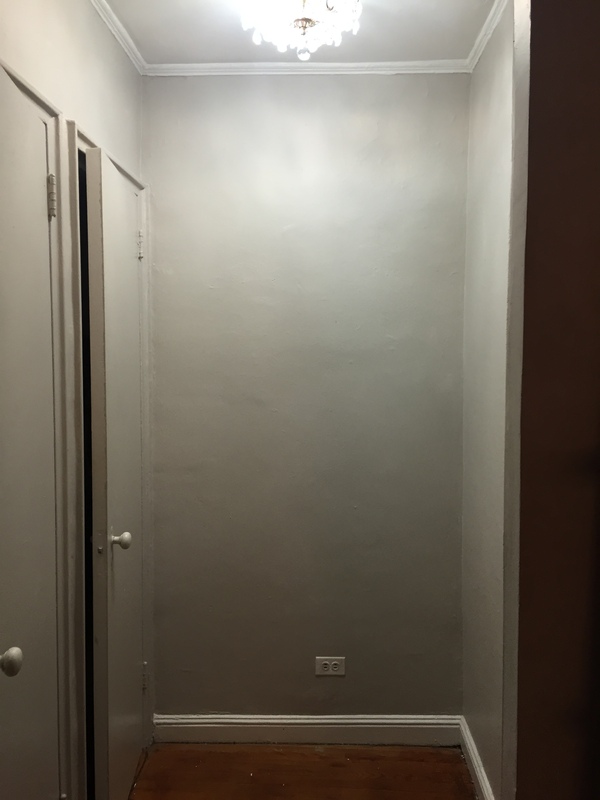 The entryway and dining area finally got painted! After months of deliberation, I picked the color I liked the best all along: Benjamin Moore Apparition. I had been afraid that it would be too dark, but these rooms have overhead light, which makes a big difference. So I trekked the 7 blocks to the paint store, got two gallons of BM Aura paint in eggshell, and carried them back to my apartment. Most of my other paint supplies are from the hardware store closeout sale back in December (which includes a roller, roller extender, roller cover in a thick nap, and a paint tray (sorry I forgot to take a picture before I got started–I was just too excited!)). My cutting in brush was the same one I used on my door. I had to stop to move the furniture into the living area, and then it was time to get started! 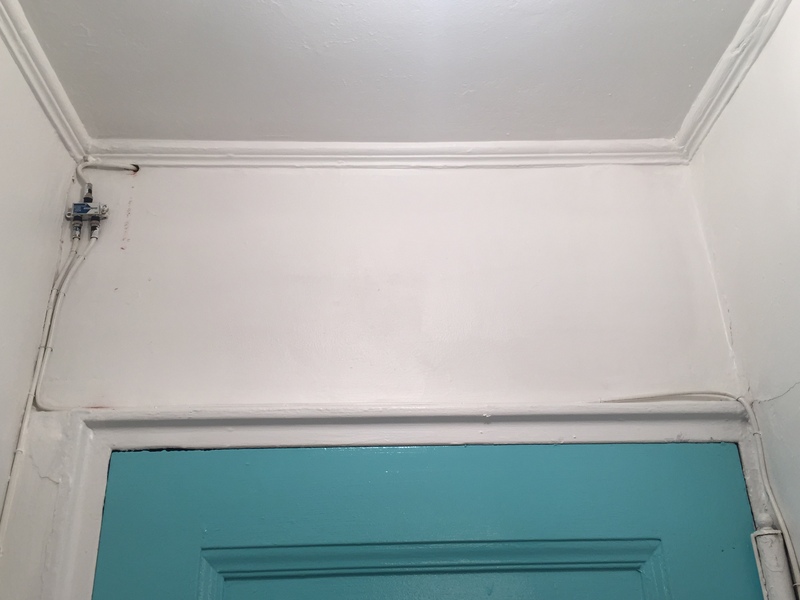 There was one last cord to nowhere that I removed before painting. It’s the one on the right that goes over the door and down the side and was easily removed. Cutting in took almost four hours! The drop cloth ensured that I kept my floors mostly clean from stray paint, and the plastic sheet had quite a bit of paint on it by the end. Then it was time to roll, which went much quicker! 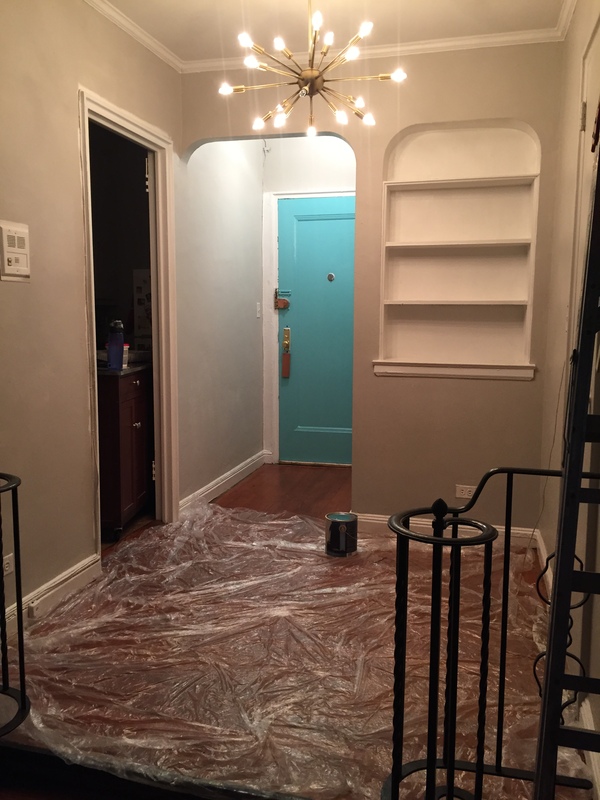 The whole process was repeated the next day for the second coat. And dragging my furniture back in was the best part! I was afraid that the color would be too dark, but it’s not dark at all. A little moody and velvety smooth. 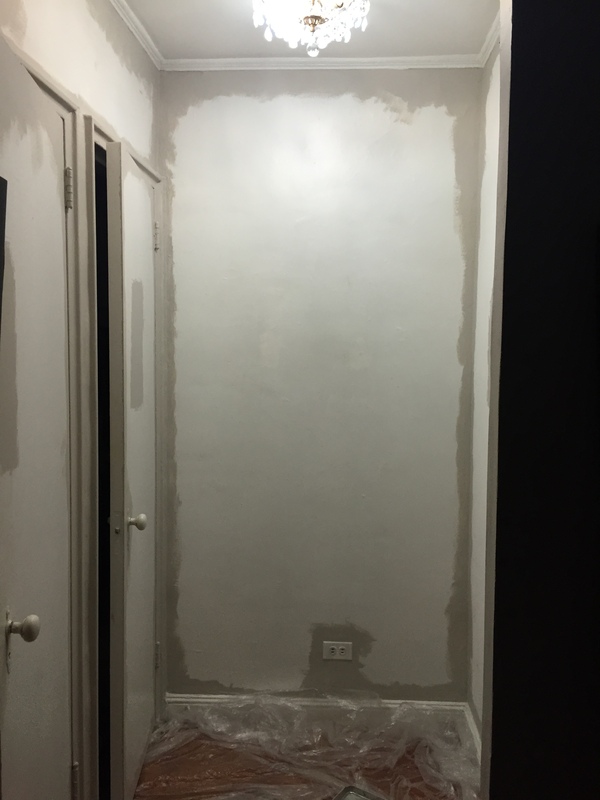 Also, the many imperfections on the walls aren’t as noticeable now that the walls are in a flatter finish (I think they were semigloss before). It’s definitely warmed the space up, and made it feel more welcoming! PS. Thanks to my brother for the great post title!